While creating Duolingo’s new Design Guidelines, I decided it was finally time to update our logo. The wordmark appears millions of times a day as users open the Duolingo app to learn a new language for free, yet it hasn’t been touched since we were a 5 person startup. Now, with more than 100 employees and operating at a scale far greater than we ever imagined, we decided to give our logo some careful – yet significant – updates. When the company was first founded in 2011, Duolingo’s Cofounder and CTO Severin Hacker famously declared “I don’t much care what you do in terms of style, but please don’t use green. I hate green.” so Duolingo’s Cofounder and CEO Luis von Ahn asked that the logo be an owl (for knowledge), but he expressly requested that it be made green, purely to annoy Severin. The original wordmark had been modified to accentuate the ‘L’ and ‘G’ characters, for fear they would be misread otherwise. The result was a logo that was more often than not read as ‘DuoLingo’, leading to our name being constantly misspelled in the media and by users. The new logo was redrawn from scratch to be more geometric, balanced, and confident, while retaining it’s most identifiable characteristics. Our biggest hope? That users wouldn’t notice at all – but we would. Until now, designers had been left to create their own logos for new products, resulting in brand fragmentation and internal confusion on which logo to use and when. A custom font was created for internal use only based on the new logo, finally allowing designers to simply type out product logos in multiple weights and in a consistent format. A complete identity system was designed to eliminate inconsistencies and finally bring all of Duolingo’s product logos together under one brand identity framework. 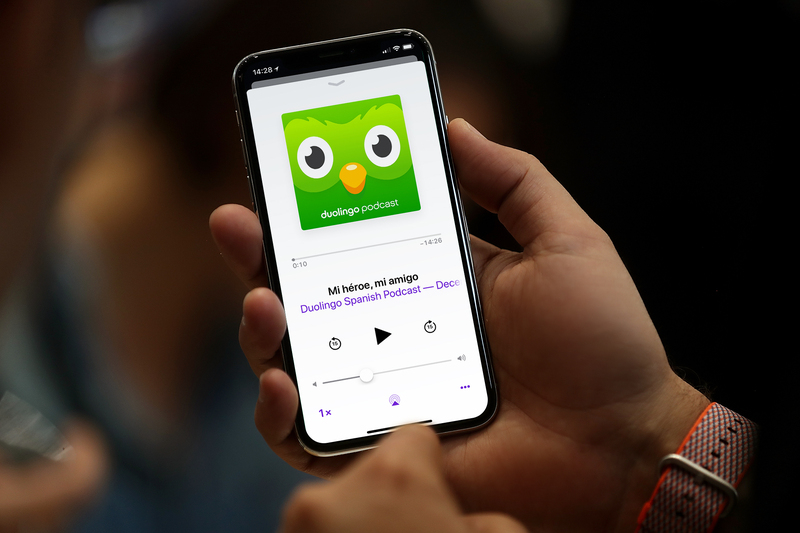 The new logo first appeared on Duolingo’s first ever billboard – a massive advertisement plastered on a building along Highway 101 in San Francisco; the primary commuter route in and out of the city. The controversial billboard was impossible to miss for the thousands of tech workers forced to sit in hours of slow moving traffic during rush hour every day, and encouraged them to quit the Bay Area and move to a city where they can walk to work, and afford to buy a home. Credit: Tyler Murphy – with input from Jack Morgan, Greg Hartman, Severin Hacker and Luis von Ahn. The billboard also marked one of the first times we’ve used a geometric sans serif font for body copy – a choice much better suited for this application than our typical go-to, Museo Sans Rounded. Around the time that we updated our logo, Duolingo’s Cofounder and CTO Severin Hacker tapped me to design a series of ‘Propaganda’ posters, featuring popular inside jokes and sayings the company has adopted over the years, with visual puns baked in. The Posters are printed locally in Pittsburgh PA, using a digital press on Every Satin at 18×24″, to be framed and hung at various places at Duolingo HQ. Thanks to Tyler Murphy, Luis von Ahn, Gregory Hartman and Severin Hacker.